Those looking for some solid performance in an ultraportable without having to pay the price of a MacBook Air would be well served by the Core i7 packing TimelineX 1830T. It retains the compact dimensions typically found in 11-inch netbooks but provides a solid computing experience like a traditional laptop. A well balanced ultraportable with good battery life and a not-so-good touchpad. If you want a netbook because of the convenient size and amazing battery life but need better multitasking and video performance than what a cheap netbook offers then the Acer Aspire 1830T might be the perfect notebook for you. Keep reading to see what this $900 ultraportable offers. The keyboard and trackpad on Acer's latest ultraportable laptop aren't perfect, but the sacrifices involved are acceptable when the result is such a sleek machine. This 11-inch ultraportable squeezes Core i7 power into a slim and attractive 3-pound design. 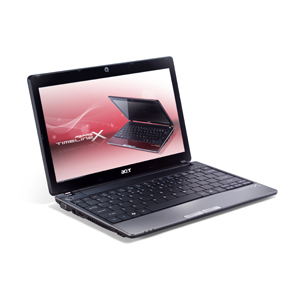 With its refresh of the TimelineX series, Acer has created another compelling ultraportable. The 1830T's fast performance and long battery life make the notebook an excellent companion for students and business users who are always on the go. If you can live with the smallish keyboard and the somewhat steep price, this Acer may have your name on it. At the end of the day, I am very impressed with the Acer Aspire TimelineX 1830T-68U118 notebook. This is one of the few 11.6-inch ultraportable notebooks that have a keyboard larger than some notebooks with as much as three more inches of screen space. That means you can work all day comfortably without wishing you had an external keyboard. The new 11.6-inch MacBook Air isn't the only contender for the high-end ultraportable crown. The $899 Acer Aspire TimelineX 1830T-68U118 looks like a Netbook from the outside, but inside, its specs are utterly upscale. Acer's high-end and extremely portable 11.6-inch TimelineX 1830T-68U118 offers a great combination of processor power and features that match what you'd find on a full-size laptop. If you love the portability and compact form factor of netbooks, but you aren’t a fan of their sluggish performance and stripped-down feature sets, Acer offers an excellent compromise for you. It looks like a netbook, but the TimelineX packs the power of a full-size notebook. Road warriors who value light weight and a small size will bond with this tiny powerhouse. The Core i7-680UM is a power efficient ultra low voltage processor for laptops. Using Turbo Boost it can be clocked with up to 2.5 GHz. Thanks to Hyperthreading, 4 threads can be processed simultaneously. An integrated graphics card (Intel HD Graphics with 166-500 MHz) and a DDR3-800 memory controller are also included in the package.